I love being Canadian and living in a country where we can experience all four seasons in their full expressions. Having children has like so many other things revived my love of winter. There is nothing like that sweet fresh winter's air while playing in the snow. This weekend was no exception. We had a skating party on lac St. Antoine and it was fun, fun, fun! Saturday morning we cleared off a good sized rink. It was hard work and we worked as a team and got it done. There was a little moaning and groaning coming from little people and they persevered and reaped the benefits later a we skated, played hockey and had so much fun with our friends. Owen fell in love with hockey. We made two teams mixed with adults and children. It was so beautiful to have the adults encouraging the children. Owen was so proud and his chest puffed out with pride by the minute. He is a natural. I was really proud of him and loved watching his focus and perseverance. He fell in love with hockey. I saw a light of passion spark up in him. That night at bed time he said: "I am good at playing hockey". He felt really good about himself. Lacing up my skates always brings me back to memories of my dad helping me get ready for ringette practice. He was the best at tying up my skates nice and tight. I found myself on a pair of skates on many occasions for many years of my life. I grew up in a hockey family. I have very strong memories of my father and his friends hunched over their chairs leaning into the tv watching hockey night in Canada. It was inevitable wherever you were in the house you would hear "He shoots and he scores!!!!" yelled with enthusiasm and joy. By far the best part of the whole affair was gathering with friends. It's true, when we come together as a group and do something together and feel connected to people we feed into our well of happiness. The party was on Saturday and still today on this Monday morning I am glowing from my great Canadian experience. Wednesday's bring me to Zoe and Owen's class room to teach a 30 minute yoga class. I love teaching these classes. The kids really get it. At the beginning of class things are a little chaotic especially in Owen's class and by the end the children are centered, focused and the stillness in the room moves me. Together we create a meditative energy. This week we talked about gratitude and how being grateful for what we have is a key to happiness. At the end of class we had a sharing circle and shared our gratitude. Children are insightful and I love hearing their answers: "I am grateful for my family" "I am grateful for my education" "I am grateful for the food I eat" and so much more. I am grateful for Sun rays. I am grateful for self expression. I am grateful for adventure. I am grateful for music everywhere. Happy Friday to you and please do leave a comment with what you feel grateful for. Here is an inspirational video, even animals are creative! Enjoy! This weekend was dedicated to hanging with my sister, our kids and lots of wool. We set up the crafting tables down in the big yoga room and felted day and night. Kids played and when the urge took them they joined in on the felting fun. With valentine's around the corner we focused on felting hearts and dolls. I have so many hearts made that I am having to think of different ways to use them. I started making a wreath (above) which I will put hearts all around. I wet felted it and part of it is drying on my kitchen counter. Hanging with my sister is easy. It's easy being with one another hanging doing what we do. She is one of the people on this planet that understands me the best. Having grown up under the same roof with the same parents there are some things that only she and my brother understands. We also have some of the same genetic makeup which binds us. Together we can laugh at simple things and we trust each other with the matters of our hearts. So in a way it's fitting that we spent the weekend felting hearts and honoring love as we do really love each other. Zoe has been in heaven with her little cousin to carry around. She is really coming into herself. She's been changing diapers and just loving playing big sister. You would think that after hours of felting hearts, and wet felting we would want to pack it in but not us ladies, oh, no! Last night Karie from workermade came over and we started on this cute bride and groom for our wed by hands show in a couple of weeks. I am working on the groom and having so much fun with this project. She left with the bride 3/4 made and I look forward to seeing what she comes up with. Last but not least here is the garland that Mad made. It's so cute and I am going to do the same with some of my hearts. Inspiration often strikes with a flood of creative energy, ideas layered upon ideas. Other times creative inspiration dwindles and I am left searching for inspiration elsewhere. When I look around inspiration lives everywhere from fluffy snow falling from sky, to a warm cup of tea, to a hug and so much more. Children are also my inspiration as they laugh out loud, play with passion, draw photos with perspectives that the corners of my mind can't go. A few years back when Zoe was still a baby I dreamed of what I am living now. My dreams were of a place where I could teach yoga and give felting workshops. At that point I had dancing images of smiling people getting inspired through yoga and crafting. It's now 6 years later and I have a big room, painted red that's ideal for a small yoga classes, daycare and workshops. I love making things and I love teaching others to make things. It always amazes me when my dreams manifest themselves into reality. My moving here came to me effortlessly, things just seem to be falling into place with ease and grace. I truly feel blessed. In yoga we say that when you are living your truth, things come easily. This must be my path and I am enjoying every step of the way. I hope you have a most fabulous weekend. I will be away from the computer these next few days, spending time amongst the trees in Wakefield, skating on a lake, snow shoeing and taking life at a slow pace. I leave you now with felted creations by last night's felters. Our pencils, pens and scissors have been sitting in these plain recycled tin cans. For the longest time I have been wanting to pretty them up. Finally yesterday after many months of daydreaming the project, we brought it forward. We took scraps of material which were donated by my lovely sister Mad, splashed glue all over the surface and placed strips of the pretty material all around. This is what we got. It's pretty cute, I am happy with it and the kids had great fun. There was also a little time for face painting. There is nothing that the kids like more than to get themselves all painted up! The Happy Planet Index states that the first element of happiness is to connect with others. I must say that this statement does resonate with me. I definitely feel happy when I am socializing and sharing with my children, in a group of people or with a good friend. In my busy lifestyle I am often so preocuppied that I forget to call that special someone, or make plans, and so on. In this new year I vow to strengthen my existing relationships, develop new ones and of course connect with that deeper part of me. I vow to stop, take deep breaths and really see my children for who they are, growing beings that need lots of love, understanding and compassion. In order to facilitate my mission I turn to my yoga practice which allows me to connect with my breath and those deeper parts of me facilitating my relationships with others. This weekend I was definitely successful in my new quest for deep relationships. We met my sister, nephew, niece and friends at the Arboretum sliding hill, went skating and attended Zoe's good friend Lila's birthday which involved a lovely sleigh ride. Magical fluffy fat flakes of snow drifted from the sky which definitely portrayed elements of a fairy tale. Although we were very busy I feel very recharged and well yes connected! Have a look at this cute mermaid felted by Lauren who is 6 soon to be 7. I always wonder what happens to the roving I sell and it's nice to see this work of art made by a young artist. Children truly do enjoy felting. Do you have any projects that you would like to share? It is my mission to inspire others and get others to inspire. What inspires you? I hope that 2011 finds you well, happy and healthy. I am looking forward to the possibilities of this new year :) I had so much fun giving workshops in 2010 that I have created these workshops for January 2011. Please join us for some inspiration, good conversation and loads of fun! 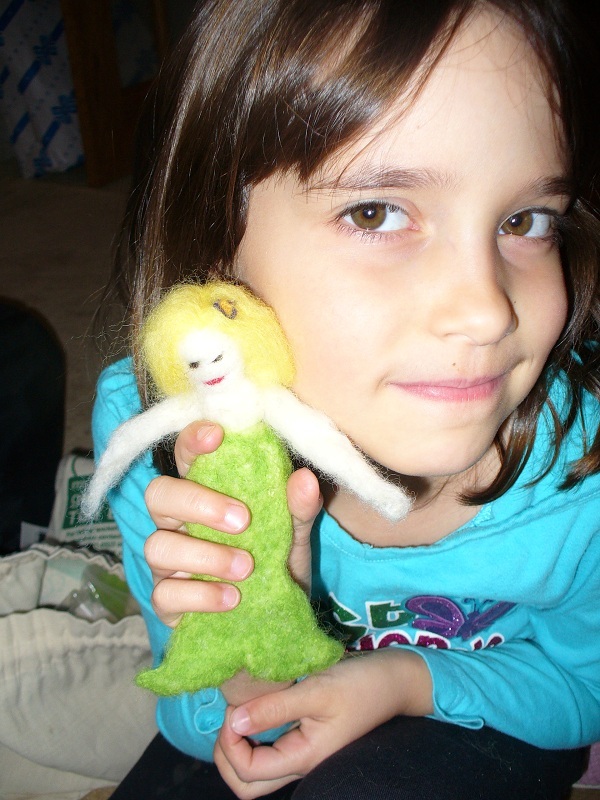 I welcome you into my home to learn to make needle felted dolls. These dolls can become a guardian doll for a child in your life or a center piece on your nature table. Not sure what a nature table is? No worries, you will also learn about the joy of creating a nature table in your home and it's year long story. Come and have fun with me! I love giving these workshops I get so much fun out of spreading the joy of this fun and easy craft. I look forward to felting with you! Your Investment: $35/includes supplies, nibbles , warm beverages and inspiration. Your Investment: $60/includes supplies, nibbles , warm beverages, soup, bread and inspiration. Spend the day with inspiring people as you wet felt a work of art. Wet felting is the medium of forming felt by applying hot water, soap and friction to bind wool fibers together. Using this fun technique you will have the option of making playmats with caves, streams and bridges or a wall hanging for a special someone or spot in your home. My mission in hosting these workshops is to join together, craft, chat and get creative. Think you are not creative? Well I truly believe that we all are. The great thing about felting is that it's fun, easy and everybody feels successful. Spend the morning with your child doing yoga and making needle felted heart pins for loved ones. Our morning will begin with a yoga class, followed by a light snack and a craft project. 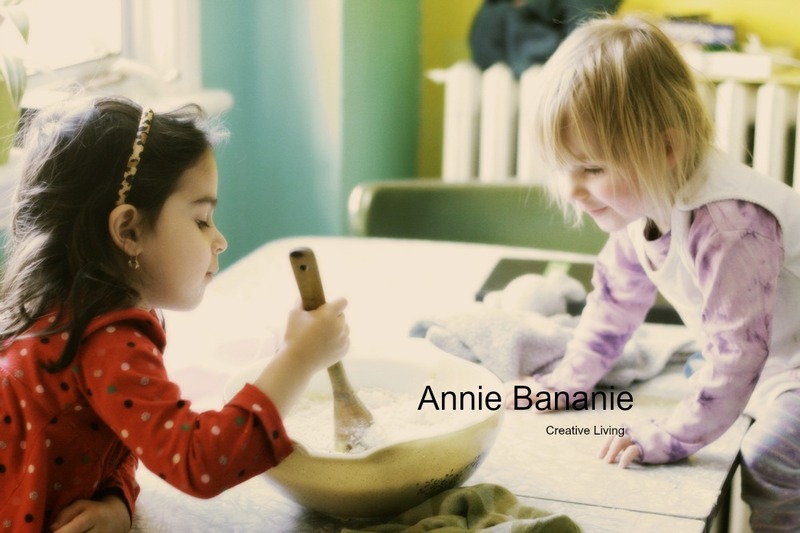 During crafting time children are encouraged to free play or craft. A caregiver will be on sight to engage the children.